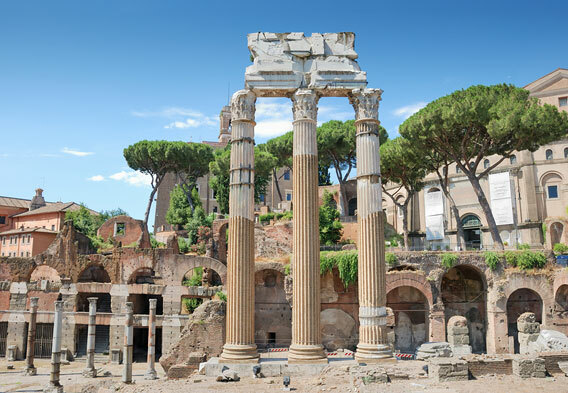 Construction of the Roman Forum predates the Roman Empire by centuries. Built at the center of Rome, the Forum was one of the city's most important gathering points. People came seven days a week to visit the temples, government buildings, and marketplace. The structure is known as the Foro Romano in Italian. The earliest temples built on site were dedicated to Saturn and the twins Castor and Pollux. By the Middle Ages, the Forum fell into disuse; at some point, it was turned into a meadow where cattle would graze. Marc Antony delivered speeches at the Forum's Rostra, including the funeral speech of Julius Caesar. 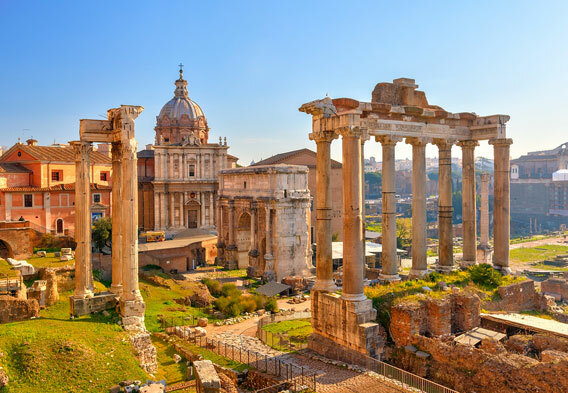 The Roman Forum is a reminder of the Roman Empire, a marvel of engineering and a testament to human achievement. Standing proud for 2,000 years, the plaza in the center of Rome remains one of the world's cultural treasures, in a category with the Great Wall of China, the Parthenon, and the Angkor Wat temple complex. One of the most sought-after sights in Rome, the Forum remains at the top of the list for most visitors. Now standing as ruins of temples, monuments, and other structures, the Forum still welcomes crowds. While standing on the plaza next to the arches and monuments, you almost see the crowds of watching a triumphal procession or rushing to the start of the next Senate meeting. Even though the Roman Forum is a grand sight to see, it does lie in ruins. Over the past 2,000 years, the forces of time, wind, and weather have taken their toll on the forum, but yet it remains. As their empire stretched from the British Isles and European continent to North Africa and the Middle East, the Romans brought their wealth, skills, and influence with them. They built walls, roads, aqueducts, and other infrastructures, along with temples and auditoriums, everything needed for a civil society. As the Roman Empire fell and time marched on, the buildings wore down, but they were never forgotten. As long as people have been organizing into societies, they've need gathering places. In Rome, the Forum complex provided a center of life in the center of town. Built in a valley between two of the city's famous hills, the Forum was a natural gathering place. 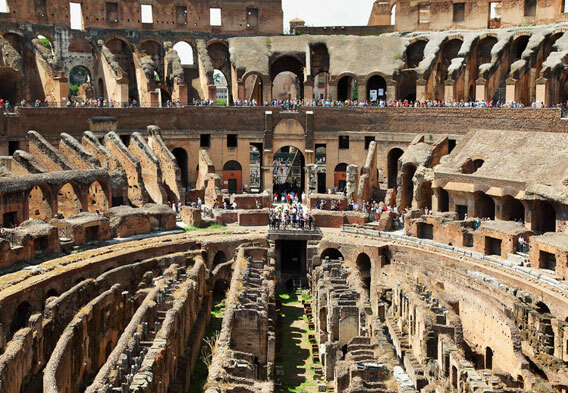 In ancient Rome, the Forum began as a marketplace. When Numa Pompilius was the second King of Rome, he added to the site, building a palace and other buildings. Over time, the site grew as more rulers and builders left their mark; soon temples were built in dedication to Vesta, Saturn, the twins Castor and Pollux, and other deities. By the time of the Roman Empire, construction began in earnest. Marcus Portius Cato added the basilicas, large halls, by 184 B.C. By a century later, the large records hall, the Tabularium, was constructed, making it one of the largest structures in the entire Forum. Before he was assassinated, Julius Caesar oversaw a project to re-arrange and improve the Forum, including moving the Senate to the Curia Julia. As more time passed and Rome's influence waned, so did use of the Forum. Eventually, the site began to fall into ruins. Many of the buildings were transformed into Christian churches, and some were just left as is. By the 19th and 20th centuries, the Forum became home to archaeology digs and serious scholarly study. Archaeological work is still ongoing at one of the most popular tourist sites in one of the world's great cities. Buildings at the Roman Forum served many purposes; some were built as temples to gods or monuments to great rulers. Other buildings housed the Senate and other governmental work, while other structures helped serve the community. The earliest temple was dedicated to Vesta, the goddess of the home, while a surrounding building provided a home to the Vestal Virgins, who attended the temple. Others were dedicated to Saturn, the god of the harvest, and Castor and Pollux, the Gemini twins. During the height of the Roman Empire, the Senate met at the twins' temple before moving to the Curia Julia under the reign of Julius Caesar. The plaza also includes the Regia, the royal residence, and the Tabularium, where the records were kept. Important speeches were given at the Rostra and the Forum's gathering spots. Other buildings, called basilicas, were used for governmental work. It wasn't until later that the word was applied to places of worship. Several basilicas were built at the Forum, including the Basilica Porcia, built by Cato the Elder, and the Julian Basilica, built by Caesar August, the first Roman Emperor. Built for strength as much as beauty, the arches of the Roman Forum remain some of the most striking ruins still standing. The white marble of the Arch of Septimius Severus continues to glimmer in the sun. It was built in A.D. 203 to celebrate a military victory of the emperor who named the monument. 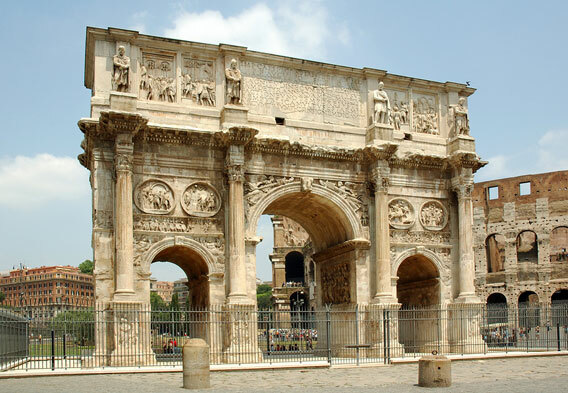 The Arch of Titus, dating from a century earlier, and still standing, was a project championed by Emperor Domitian to honor his brother's victories. Many other arches remain, standing as a reminder of the Roman Forum that once was and the empire's great victories. The Roman Forum stands at the center of the city, close to many attractions and historical sites. The ruins of the Roman Colosseum lie just to the west of the forum, and it's a short walk to the Capitoline Hill, once home to a temple dedicated to Jupiter. Today, two museums occupy the site-the Palazzo Nuovo and the Palazzo dei Conservatori. The Parthenon, another one of Rome's treasures, also stands near the Forum, as do the ruins of the Baths of Diocletian. Not everything near the Forum lies in ruins. Rome is a modern city, with plenty of shops and cafes to enjoy. Several of the Rome hotels are within minutes of the Forum and its majestic monuments.